RKF Engineering Services had undertaken prior works for our client, a coal terminal on the South Coast of New South Wales, Australia, which had identified the need for concrete repairs to the concrete supporting the fenders along berth 102. Since the concrete repair works are to be staged over several years, RKF Engineering Services was engaged to design a purpose build working platform that will accommodate ship movements and allow all aspects of the repairs to be completed without having to modify the structure once works have commenced. Our experience in the development and detailing of structural designs is vast, with over 75 years of combined experience within our engineering team. The structure was developed in consultation with our client, to ensure that RKF Engineering Services understood the operational constraints, construction tasks and site conditions that the structure will experience. Using this information, we developed concepts and continued to develop the structure in consultation with the client until it was deemed acceptable for detailed design. The final structure was detailed with some elements of the structure built from aluminium and others from steel. 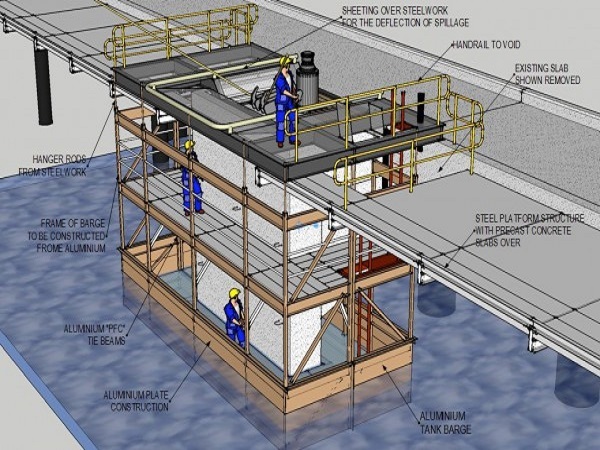 The final design was provided to withstand the rigors of operating in a tidal harbor alongside ship movements and to provide a safe and functional place for the repair works to occur.